China launched another satellite Wednesday toward an orbit more than 22,000 miles above Earth, marking another step in building the country's own space navigation system. The Beidou satellite launched at 1553 GMT (11:53 a.m. EDT) on a Long March 3C rocket from the Xichang space center in Sichuan province in southwestern China, where it was just before midnight. Powered by three stages and two strap-on boosters, the 180-foot-tall rocket turned east from Xichang and deployed the Beidou navigation satellite into a geosynchronous transfer orbit, according to the China Academy of Launch Vehicle Technology. Engines on the satellite will further raise its altitude in the next few weeks, and the craft will eventually slide into a parking slot 22,300 miles over the equator to cover the Asia-Pacific region. 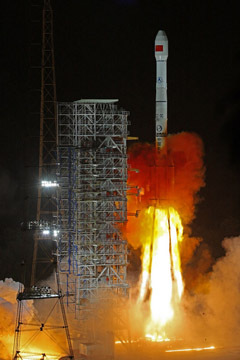 The satellite is the fourth spacecraft to be launched in the second-generation Beidou constellation. Two previous satellites were placed in geosynchronous orbit, including the system's newest member launched in January. Another spacecraft is operating in an orbit about 13,000 miles above Earth. China is developing the Beidou, or Compass, navigation system to provide its military and citizens an indigenous source of precise navigation information. The country currently relies on the U.S. Air Force's Global Positionining System network. Experimental Beidou satellites began launching in 2000, and Chinese officials hope the system can provide full navigation and timing coverage of China and neighboring countries by 2012. China will eventually launch 35 satellites to expand the system to global coverage by 2020. 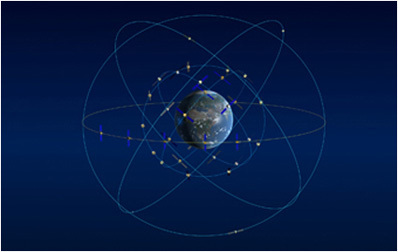 Most of the operational Beidou satellites will circle 13,000 miles above Earth. Five spacecraft will support the system from geosynchronous orbit. The constellation is China's counterpart to the U.S. GPS system, Russia's Glonass navigation satellites and the Galileo network being developed by Europe. China says Beidou services will be available at no charge to civilians with positioning accuracy of about 10 meters, or 33 feet. More precise navigation data will be given to Chinese government and military users.